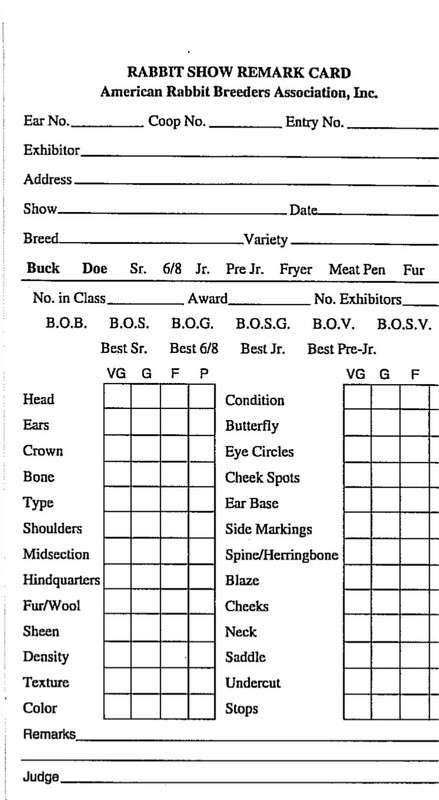 The second set of forms you must complete for a rabbit show is the Judges Remark Cards. Like the Registration Form, accuracy is critical. Incorrect remark cards may result in your rabbit being unshowable. This form serves two purposes. First it gives you a record of the judges remarks regarding your rabbit. Second, it lets the show secretary know who placed where in the judging. One remark card must be completed for every rabbit you enter. Ear No - This is the tatooed ear number of your rabbit. Judges will call off this number and give their remarks about the rabbit. Exhibitor - This should match the name on the ARBA entry form. Circle all of the terms that apply on the Buck / Doe Jr / 6/8, etc. line You should be circling at least two. The Remarks Cards are two part carbonless forms. Evans Software will allow you to print labels that can be used to complete the top portion of the remark cards. Keep in mind that two labels must be printed off for each remark card, one for the top copy and one for the bottom copy. Breed Assistant is also capable of printing labels, which we do, but setting up the form is not for the computer novice. Youth Exhibitors: Help out the show staff by placing a large �Y� in the upper right hand corner of your remark card. This lets the staff know to place your remark card with the youth entries. Its very easy for the staff to place unmarked entries in the Open group. Once you have completed the ARBA Entry Form and the Remraks Cards for each rabbit, its time to go register. Your registration will be quickly looked at, and you will have to then pay your registration fee. A writer volunteers to sit at each juding table. As the judge removes rabbits from the table, he will read off the ear number from the rabbit. The writer will find the cooresponding remark card, and as the judge comments on the rabbit, the writer will complete the remark card. One copy of the remark card will be kept, and the second will be placed near the edge of the table for you to pick up so you can review the judges remarks.